Join us for the South Asia Center’s (SAC) first visual art exhibition Thursday, October 26th. 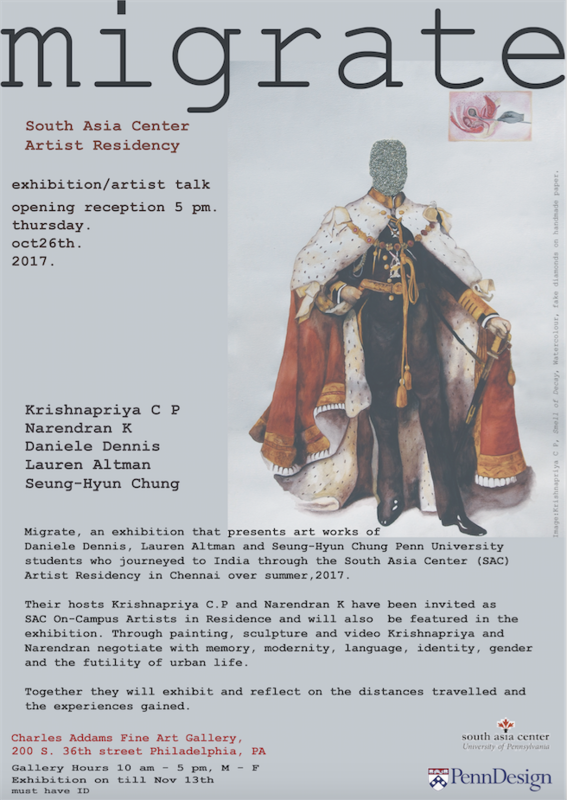 “Migrate,” is an exhibition that presents the art works of Daniele Dennis, Lauren Altman and Seung-Hyun Chung, Penn students who journeyed to India through the SAC Artist Residency in Chennai over summer 2017. Their hosts Krishnapriya C.P. and Narendran K. have been invited as SAC On-Campus Artists in Residence and will also be featured in the exhibition. Through painting, sculpture and video Krishnapriya and Narendran negotiate with memory, modernity, language, Tamil identity, gender and the futility of urban life. Together they will exhibit and reflect on the distances travelled and the experiences gained. Learn more about the South Asia Center Philadelphia and Chennai Artist Residencies here. Food and drink will be available. This event is free and open to the public. Please help us spread the word about this event by sharing it with your networks. This event is supported by the South Asia Studies Department and Penn Design.